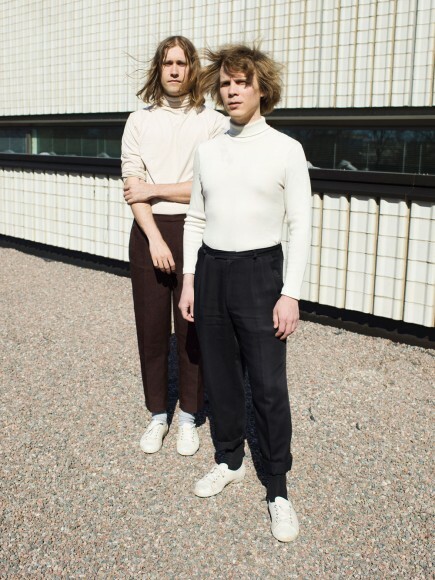 Visionary electronic pop from Finnish producers Jaakko Eino Kalevi (Domino/Beats In Space) and Long-Sam who open their account as Man Duo with the pulsating ‘What If it Falls’. The first cut from their upcoming album ‘Orbit’, this is next-level outsider electro laced with searching vocals that channels both Dopplereffekt and Simon & Garfunkel in a highly original style. “Push-ups, shaving, moisturiser.” Make this your new mantra. Written and recorded together at Sami’s place in Helsinki and Jaakko’s Berlin studio during 2016, Orbit plots a serene course through styles close to the duo’s hearts. Across eight tracks, Jaakko and Sami zone in on krautrock, funk, electro and spaced-out cyber-ballads, executing each with characteristic elan and tunefulness. In fine voice throughout, the pair’s lyrics – sung in English, Finnish and Italian – draw on the absurdities of life and love in the modern world. Orbit finds both artists pushing each other in a bid to attain new levels of harmony, whether that’s in the silken electronic funk of opener ‘One Formula’, which unravels like some blissful mid-’80s Pino Donaggio scene-setter, or in the pulsating ‘What If It Falls’, a satisfyingly unorthodox cut that calls to mind both Simon & Garfunkel and Dopplereffekt. “This song deals with events of an almost catastrophic nature,” says Jaakko. On ‘The Middle’, an epic slow-burner laced with a terrific guitar solo by Sami, the singer Sean Nicholas Savage blurs the personal and political with an impassioned turn. “We worked on this one for quite a long time but eventually what really made it work was Sean’s vocals. Took some time to realise that,” says Jaakko, who knows Sean from their time in Berlin. For ‘Ile’s Dream’ – “a krautrock-influenced song based on a dream that a friend had,” according to Sami – Man Duo channel the wide-eyed euphoria of La Dusseldorf. Then there’s ‘Tanyan Teema’ – ‘Tanya’s Theme’ in English – a sweet, bubbly groove about a film character called Tanya that first surfaced on the CORD soundtrack a year or two back, and the sleek electro of ‘Vanessa’, which relates the story of a no-show at a concert in both Finnish (narrated by Sami) and Italian (by Cecilia Butini) before bursting into colour. ‘The Boss’ closes proceedings, its layers of synths and saxophone providing a dusky end to a rich and rewarding album. Why the title Orbit? “It’s a nice-looking word and it’s pleasant to say out loud,” says Sami. Orbit is released by Solina Records. The album was mastered by Norman Nitzsche at Calyx, Berlin. Its cover photo is by Arnd Dewald. Man Duo play a handful of dates this summer and will tour in the autumn. Jaakko Eino Kalevi appears courtesy of Domino Recording Company. ‘What If It Falls’ single is taken from their new album ‘Orbit’, out 18 August 2017 on 12″ vinyl/digital via Kaya Kaya and Solina Records.